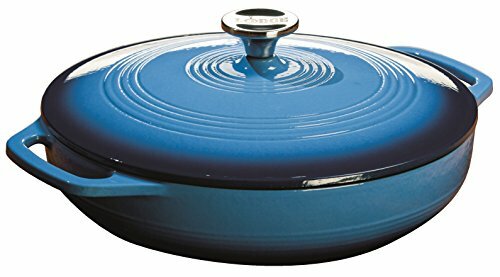 A flawless pairing of form and function, the Lodge Enameled Casserole is a classic way to both prepare and serve memorable meals. The 3.6 quart capacity and low, wide shape is perfect for baked favorites, roasted meats, or even paella. Great for cooking, marinating, refrigeration and freezing. The color porcelain enamel on cast iron can be used on gas, electric, ceramic and induction cooktops, as well as in the oven. Not recommended for use on outdoor grills or over open outdoor flames. Not for use in microwaves. Lodge Color Porcelain Enamel on Cast Iron cookware is cast from molten iron in individual sand molds. The porcelain surface eliminates the need to season cast iron. Use vegetable oil or cooking spray for better cooking and easier cleaning. The cast iron vessel has superior heat distribution and retention, evenly heating bottom sidewalls and even the lid. Tightly fitting lid seals in moisture. The excellent heat retention reduces the amount of energy needed for cooking. Two layers of very hard, glossy porcelain enamel are chip resistant and easy to clean. Use wooden, silicon or nylon utensils. Metal can scratch the porcelain. Lid knob is oven safe to 500 degrees Fahrenheit. The black rim on the pot is matte porcelain, not exposed cast iron. Hygienic porcelain enamel is non-reactive with food. Although dishwasher safe, hand washing with warm soapy water is recommended to preserve the cookware's original appearance. 11 3/4" diameter, 2 1/8" deep. Complete item measures 14.4" x 12.55" x 3.4". Broil, braise, bake or roast up to 500 degrees F. Saute, simmer or fry on any stovetop, including induction. Cast iron is unparalleled in heat retention and even heating. The smooth glass surface won't react to ingredients, plus eliminates the need to season. Lodge Enamel Casserole Dish is the perfect tool to marinate, refrigerate, cook and serve. Rims are black matte enamel, cooking surface is off-white. Stainless steel knob. Workhorses in the kitchen and show pieces on the dinner table, our enameled iron will become your go-to cookware. Dishwasher safe but hand washing recommended to preserve cookware's original appearance. Measures approximately 14.4" x 12.55" x 3.4", and is 11.75" diameter, 2.13" deep.